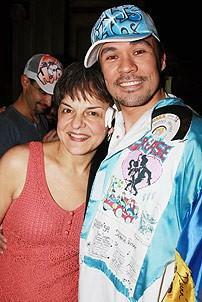 Michael Balderrama with the great Priscilla Lopez. In a long-standing Broadway tradition, Michael Balderrama of the new musical In the Heights received the coveted Gypsy Robe on March 9, just before the show's opening night performance. The robe is adorned with mementos from each musical that has opened on the Great White Way in the past year, and the cast member with the most Broadway chorus credits is the lucky wearer. Balderrama received the Gypsy Robe from previous recipient Adrian Bailey of The Little Mermaid. Click on to see Michael carry on this beloved Broadway rite.